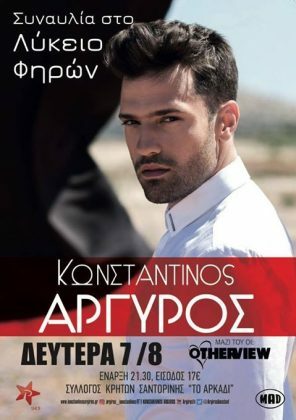 After his successful concerts in Athens and Thessaloniki, popular Greek singer Konstantinos Argyros is coming to Santorini to perform until the early hours, as his hit denotes. The youth’s favourite pop group OtherView will also accompany him. At the Senior High School in Fira. At 21.30.